Biennials are generally very beautiful plants, with most attractive flowers. They are somewhat more trouble for the gardener, since they keep growing during their first year and do not bloom until the second. Their great advantage is that their seeding stage produces new plants which will bloom again two years later, making it unnecessary to plant additional seeds. The biennials are usually planted in early summer and transplanted to good soil when they are large enough to handle. It is a good idea to pot them at this time, particularly in areas where plants cannot be left outdoors all winter. In some cases, they can be transplanted to a cold frame, and then placed in the flower bed the following spring. The requirements of careful soil preparation apply to biennials as well as annuals. After planting, if you want a continuous new growth of plants, it is best not to weed and cultivate too assiduously. If a really fastidious biennial patch is planted, it will be necessary to replace the plants with new ones each year. Perennials are the basic flowers of any garden. Each year they die and renew themselves for the next growing season. They are long-lived and last for many seasons. Perennials are also, historically, among our oldest plants. They have been cultivated for centuries and often, as a result of breeding and crossbreeding, bear no resemblance to their wild forebears. In some of the perennials, the blossoms have become so specialized through centuries of cultivation that they no longer grow ‘seeds. Other perennials are continually being developed by amateur botanists and gardeners. As a result of this cultivation and inbreeding, perennials as a rule are not as hardy as other varieties. Another disadvantage is the tendency of certain perennials to die down after flowering, thereby leaving gaps in the garden. There are a number of ways to solve the problems of short-flowering periods and the resultant unsightly spaces. One way is to intersperse perennials with annuals and other bulbs and flowering plants whose bloom occurs either later or earlier than that of the perennials. Some perennials are easy to transplant: chrysanthemums, for example, can be moved from one place to another with no noticeable effect on their vigour. This is another way to keep color and bloom throughout the growing season. 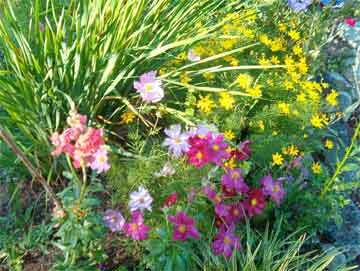 A garden of perennials, either by themselves or mixed with annuals and other bulbs, should be placed along a path, or as a border, with a background of trees, shrubs, a wall or fence. The background shows the brilliant coloring to best advantage. Some varieties can flourish in the shade, such as anemone, lily of the valley, day lilies, sweet pea, primrose, hollyhock, harebell and peonies, but these flowers must be chosen carefully and faced so that some sun reaches them every day.